My memory of past Fourth of Julys is a blurred collage of barbeques and family picnics. Usually I’m wrapped in warm clothes and shivering since summer in Seattle traditionally starts on July 5, though a few clips in my memory collage also reflect the sunshine of long lazy holiday weekends at my aunt and uncle’s lake cabin in eastern Washington. And of course, fireworks are a thread throughout all these memories. I’ve seen more impressive displays, but few were as terrifying and awe-inspiring as watching my cousin David explode bomb-like objects in the street of his residential Tacoma neighborhood. But two Fourth of July holidays stand out for me, refusing to blend into other memories. 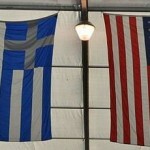 These were the two that I was in Greece on this uniquely American day. Just out of college, I went on one of those if-it’s-Tuesday-it-must-be-Belgium sort of tours of Europe with a bus full of 20-somethings. Though we were strangers at the beginning, we quickly bonded in that two-month interlude we were taking between college graduation and reality. We found ourselves on the Greek island of Hydra for the Fourth of July, determined to celebrate. In some ways, we managed a perfect American Fourth. We went to the beach (which was actually hot and sunny, a big improvement over the Fourth in Seattle) and swam among the jellyfish. We bought watermelon at a local market (which we promptly spiked with vodka…what can I say? We were college students let loose in Europe). We ate dinner at an outdoor harborside café where an understanding waiter lit a few sparklers for us. Fueled by the sparklers (and probably the vodka in the watermelon), we proceeded to sing every patriotic American song we could think of, including TV army recruiting commercials. Though I cringe now to think of a bunch of loud American college students bellowing out the Star Spangled Banner into the warm evening air on a charming Greek island, at the time I remember feeling terribly patriotic. Eight years later, I was living and working in Greece for another Fourth of July. It was just another day in the office to our Greek colleagues, who showed only a mild interest in the fact that we were missing a holiday. “Independence Day?” said Kostas. “Who did you need to get independent from?” The question startled me. Europeans seem to know so much about what is going on in the U.S. (far more than Americans seem to know about what is going on in Europe), that I assumed they knew our history, too. It was an oddly displaced feeling to want to celebrate this quintessential American holiday amidst the Greeks going about their everyday lives. Unable to find any official celebrations, even by calling the U.S. embassy (who probably thought I was a terrorist trying to find a gathering of Americans to hit), and denied family gatherings and picnics and fireworks, my colleague Dave and I decided to celebrate on our own. After months of doing our best to blend in and not stand out as loud, stereotypical Americans, we defiantly came up with a plan to be as American as we could be. My Fourth of July 1991 was spent eating hamburgers at Wendy’s (the only American fast food chain in Greece at the time, which we’d avoided for months), having dinner about 7 p.m. (in defiance of the Greek 9 p.m. dinner time), and watching the welding sparks from a neighboring construction site in lieu of fireworks. Not exactly the best celebration of what it means to be American. Not exactly the best celebration of what it means to be independent. And certainly not the best Fourth of July food I’ve ever eaten. But in trying so hard to celebrate American Independence Day without being surrounded by the normal red, white, and blue hoopla, the Fourth of Julys I’ve spent in Greece have become my most memorable.